Web services combine to give us our data, and help us use it. The web service IFTTT (If this, then that) accesses popular web applications via their APIs, and lets users create new actions based on changes. For instance, actions such as “upload photos to Flickr when I add them to my Dropbox folder”, or “send me email when frost is forecast”. I had been tempted to classify IFTTT as a merely an interesting toy for playing with social media. Granted, it’s nice that I can archive all my tweets into an Evernote note, but so what? However, IFTTT’s growth in features is showing it to be more than a bauble. The service is becoming an empowering tool that gives users more control over their own data, previously often accessible by programmers alone. 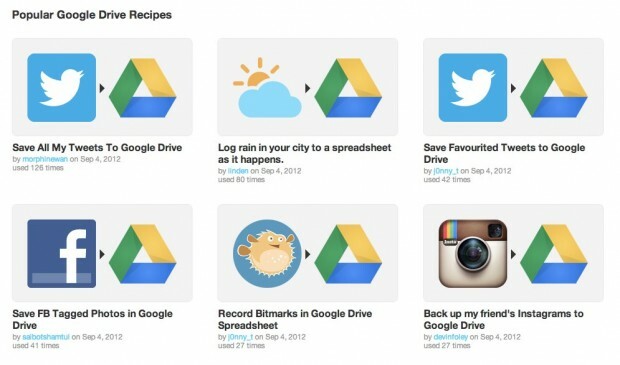 This evolution crystallized for me as IFTTT announced their Google Drive integration. In addition to supporting file storage functionality, much as it does with Dropbox, IFTTT allows you to add a new row to a Google Spreadsheet. Example applications might include copying all your bit.ly bookmarks (“bitmarks”) into a spreadsheet, or logging all the videos you upload to YouTube. Why this is a big deal? Because for the first time, it gives IFTTT users fine-grained access to their data in a simple database. This data can be freely manipulated in Google Spreadsheets without the need for coding skills. Web applications with APIs can provide a false openness. They empower developers to create value from data, under the terms the application provider dictates, but do little for regular users. The pledge of data liberation is a great thing, but again, what can the average user do with that data? IFTTT is a great example of a solution that gives our data back, and lets us do useful work with it. It’s the kind of tool we’ll need more of as we adapt to the digital nervous system in our lives. Business users should also check out Zapier, a similar offering to IFTTT, but with more focus on business web services.